Between September 2012 and January 2013, Yanagita Rikao of the Kuusou Kagaku Kenyuujo ('Fantasy Science Laboratory') wrote a series of eighteen columns for Famitsu's blog portal. The original goal of these articles was to promote Sengoku Basara HD Collection in a light-hearted way by having Yanagita analyse the moves and weapons used in the Sengoku Basara series, trying to uncover the real-world physics which made the techniques possible. I posted rough translations of all eighteen columns on this blog back when they first appeared (there wasn't much Sengoku Basara news to report on back then). A compilation of the blog posts was released by Enterbrain in their Famitsu Books line on 28th June 2013. Sengoku Basara Kagaku Kenkyuujo ('Sengoku Basara Science Laboratory') was priced at ¥1,100 and sold through import book stores such as Yesasia, Amazon Japan or CD Japan; however, the first print run sold out within days of release. I expect that a second edition will be available very soon. Given that the original blog entries were relatively short, the fact that this book is 176 pages long is a sign that the author has included some additional content. The videos from the original blog posts have been swapped for explanatory game screenshots while the comical diagrams by illustrator Morinaga Pizza remain. There are six new illustrations exclusive to the book edition. After an introduction and a recap of the previous Sengoku Basara games, the book goes straight into the character profiles. The characters covered in the original blog entries were (in order of appearance) Sanada Yukimura, Sarutobi Sasuke, Katakura Kojuurou, Ishida Mitsunari, Chousokabe Motochika, Date Masamune, Mouri Motonari, Takenaka Hanbee, Honda Tadakatsu, Kuroda Kanbee, Uesugi Kenshin, Kobayakawa Hideaki, Saika Magoichi, Maeda Keiji, Oda Nobunaga, Tokugawa Ieyasu, Tsuruhime and Fuuma Kotarou. These profiles have all been expanded with additional statistics and explanations. Accompanying them are four brand new character analyses. Ootani Yoshitsugu's covers his ability to float and manipulate his strange orbs before examining the science behind his movement skill. The author spends much of Matsunaga Hisahide's chapter admiring his brazen use of gunpowder with little consideration for trivial matters such as safety. Kasuga is revealed to be both monstrously strong and quick in an examination of her kunai power and Basara technique. Tenkai's weapons are shown to be unusually heavy too, but that pales in comparison to Yanagita's attempts to explain how his soul-draining abilities work within the limitations of current science. There are two extra articles included to add a little variety to the studies. 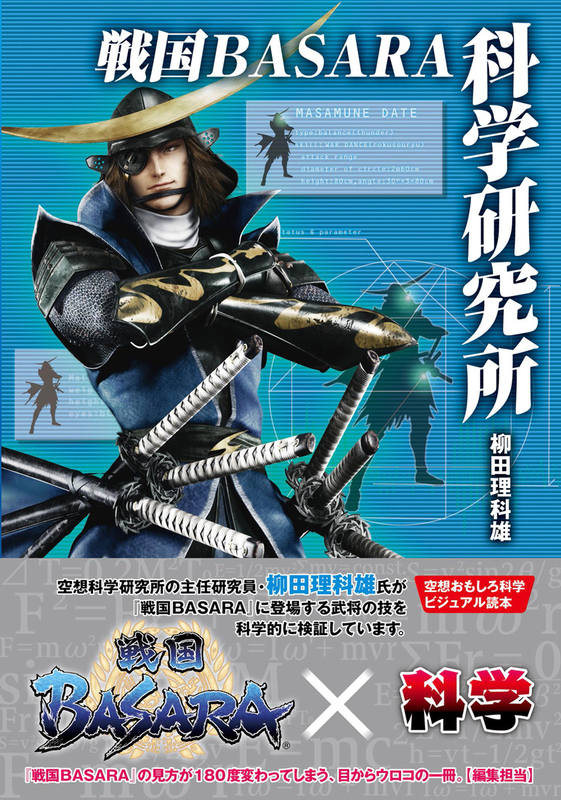 The first of these is titled 'Date Masamune vs Sanada Yukimura', an 8-page feature all about what would happen if the two warriors clashed in battle the way they're shown to do in the game's cutscenes. Given the source material that they're working from, the statistics are crazier than ever. The second bonus column is 'Yousai Fugaku vs Teruhi No Ookagami', pitting Motochika's colossal maritime fortress Fugaku against Motonari's lethal mirror contraption. The results are...inconclusive, with the author deciding that each weapon has its own strengths and weaknesses depending on the circumstances. Sengoku Basara Kagaku Kenkyuujo is written entirely in Japanese so aside from the cute cartoon diagrams (most of which are already available on the existing blog) and a few illustrative screenshots, this book won't be much use to fans who don't feel comfortable reading the language. If you happen to be learning Japanese and have an appetite for science, however, you might find reading this book an interesting challenge!